It has been 48 years since the last executions took place in Canada. One might ask why we need Ken Leyton-Brown’s book The Practice of Execution in Canada. (UBC Press, January 2011, paperback: $32.95) My thought is that in addition to being an incredibly important historical record of the public and then private practice of executions in Canada, Ken Leyton-Brown’s work will serve as a very useful resource for those of us who disagree with the use of the death penalty, in our own country and elsewhere. Post confederation, there were over 700 people executed: between July 1, 1868 and December 11, 1962. July 1, 1868, was the first execution after confederation; the same day Canadians celebrated the first anniversary of their young country – a crowd of 8,000 gathered in St. Hyacinthe, Quebec to witness the execution of Joseph Ruel. He took 17 minutes to die. By 1870, the law was changed and in the future the hangings were to take place within the walls of the prison, although the implementation of this took time. By its very nature, this book is not an easy read. The account of botched executions, death by strangulation, severed heads, as well as evolution of the institution of execution in Canada is tough stuff, and so it should be. Over 700 people hung, all for the crime of murder, with the exception of Louis Riel, who was hung for treason. The Practice of Execution in Canada lays bare the role of the institutions of the state. The jury, the judges and hangmen all had a responsibility. The federal Cabinet was also required to issue an Order-in-Council before each hanging. In 1885 the “Cree Eight” were hung in Battleford. They had been arrested in the aftermath of the Saskatchewan Rebellion and tried for murder. In this case, the authorities decided that First Nations people needed to be shown what would happen to those who rebelled, so their people were rounded up in large number and brought to witness the execution. Bungled executions created special problems for the institution and contributed to the evolution of the process. In 1918, Thomas Fletcher was hung.However, as reported by the Winnipeg Free Press, hangman [first name] Elliott (the correct name was Arthur Ellis) botched the process. The rope was too long and when the trap was sprung Fletcher’s feet dragged on the ground and it was necessary to haul him off the ground and hold him suspended until he was pronounced dead. After 34 minutes his pulse ceased and after 44 the jail physician pronounced him dead and gave permission for the body to be cut down. Dan Prociew was hung in 1926, at dawn.The drop given by the hangman was too long and Prociew’s head was severed from his body. (This time Arthur Ellis was again the hangman). Reports indicate Prociew “met his death calmly.” Heavy men and men with weak necks (a characteristic of the 11 women who were hung) typically created a challenge for their hangman. In 1935 when Tomasina Teolis was hung, her decapitation was so distressful to everyone present that the practice of inviting witnesses was soon ended. This book also records the special rituals and traditions that everyone on death row confronted: the costumes and uniforms of the guards and the court officials. The majesty and the power of the state was on full display – the ritual that established this was after all part of the justice system. 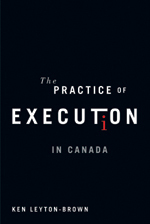 Ken Leyton-Brown has tackled an enormously important piece of research and The Practice of Execution in Canada will, without a doubt, serve as an important reference. Everyone who opposes, and also those who favour the death penalty should read it. While the death penalty is increasingly recognized as wrong, and more countries become abolitionist, it continues to be used too frequently. In the United States, the death penalty is subject to increased debate and challenge as wrongful convictions, the bias in the judicial system, as well as the cost, cause the institution to be questioned. As an Amnesty International activist, I have worked to oppose the institution of the death penalty and also its application in specific cases. While the numbers are on the decline, large numbers of people continue to be executed.In addition to the USA, the practice continues in China, Iran, Iraq, Yemen, Sudan, Vietnam, Syria, North Korea, Japan, Egypt, Libya, Bangladesh, Thailand, Botswana, Singapore and Malaysia. The death penalty is the ultimate denial of the right to life, premeditated and cruel execution by the state, an inhuman and degrading punishment that violates the right to life as proclaimed in the Universal Declaration of Human Rights. If you still have any doubt about this I’d recommend you read: The Practice of Execution in Canada. Gord Barnes, is an Amnesty International volunteer, activist and fieldworker living in Regina, Saskatchewan. One of the several reasons he became involved in Amnesty International was out of a concern that the reintroduced debate in Canada’s Parliament on the death penalty would result in the return to executions in Canada. On June 30, 1987, a motion in the House of Commons to bring back the death penalty was soundly defeated on a free vote (148-127), despite public opinion polls indicating majority support.